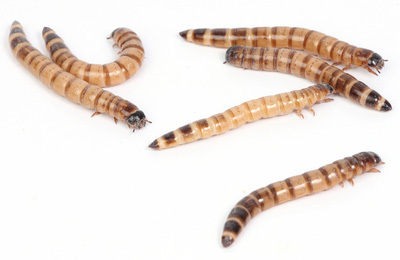 Mealworms are the brown worm-like larvae of darkling beetles. They are the second of four stages of life and exist to eat and grow until they have enough energy stored to begin transformation into pupae and then beetles. Mealworms can be found throughout most of the world where they prefer warm, dark, and damp places like under decaying logs and leaves. They are designed for burrowing and eating and will feast upon grains, vegetation, spoiled food, and many other types of fresh or decaying organic matter. These insects are an important part of the ecosystem. Their voracious eating habits aid in the decomposition and cleanup of unwanted organic matter. They are also an important food source for many animals. In the wild, birds, spiders, rodents, reptiles, and other insects prey upon them. Unfortunately, their eating habits and affinity for grains also make them pests in the modern world. Mealworms can get into and ruin stored flour, pet food, mill feed, cereal and other dry goods. Mealworms are a popular feeder insect for bearded dragons, bluebirds, chickens, fish, and many other animals. They are high in protein and fat and are easy to maintain. They are available live or pre-killed and dried. Live mealworms can be stored in a refrigerator for months. All you have to do is take them out of the refrigerator about once a week and give them some food for a few hours. They are also easy to raise and reproduce in large numbers. A female darkling beetle can lay hundreds of eggs. Dried mealworms are worms that have been freeze dried or slowly oven dried. Dried worms usually float which can make them a great treat for ducks and fish. They retain much of their nutrients, last longer than live worms, and are easily stored until needed. How to take care of mealworms so they grow and reproduce. Information about the four stages of a mealworm’s life. Learn all about what makes up a mealworm. How to dry roast mealworms and their nutritional value.